Lovely great day! Neither Ted nor I have driven the delta area – Route 90 down into New Orleans – through those Parrish’s. Fantastic drive. We spent much of it on Route 182 – which is probably old Route 90. It’s not a long distance – but it’s not a fast road. We meandered and spent the better part of the day getting here. Andi keeping watch for alligators! 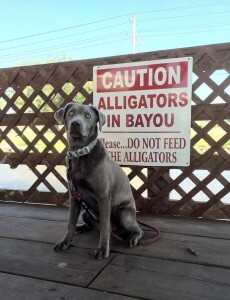 At the Bayou Delight Restaurant. Stopped for lunch in Terrebone Parrish – I ordered the shrimp PoBoy and Ted had red beans and rice with sausage… We could eat only about half each! Groaning we continued on to New Orleans. My cold is better – but suffered with a bad headache much of the day. I’m hoping wine and food at NOLA’s will make it all better! We are enjoying our first endeavor with AirBNB in New Orleans. We chose an apartment just out of the Quarter on Esplanade. The owners are great. The apartment is very nice! The owners have 4 dogs and are pleased to have Andi here. It’s kind of fancy inside – so I’m a bit nervous…. Mardi Gras is this next Tuesday. All through the small towns and in New Orleans you can see the preparations for parades and decorations on all the houses and streets. It’s like Christmas but with a Mardi Gras theme. The small towns… really something to see. All the stately homes on the main streets. The big oaks with the dripping moss. Really beautiful and like a time long past.